1881 - This historic hotel traces its origins to March 1, 1881, when George C. Boldt, an immigrant from Prussia, and his Philadelphia-born wife Louise Kehrer Boldt, opened the Bellevue Hotel (later referred to as “The Little Bellevue”) on the northwest corner of Broad and Walnut Streets. 1888 - Boldt bought the property directly across the street and opened the Stratford Hotel on November 17. 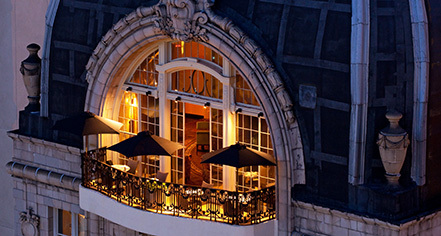 Named for the birthplace of the favorite playwright of the day, Shakespeare, it was initially intended to accommodate the overflow from The Bellevue. 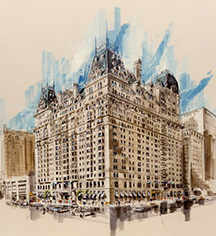 1904 - The reputation Boldt established was such that in 1890, William Waldorf Astor invited him to become the proprietor of his new Waldorf Hotel in New York. Meanwhile, business was booming and Boldt commissioned architects G.W. and W.D. Hewitt to design the grand French Renaissance structure that now stands on its site. Opened on September 20, 1904 after two years of construction, the grand Bellevue-Stratford opened her doors. 1912 - No sooner had the original building opened than Boldt began to expand it, bringing its three-story-high western end to the full 19-story height of the rest of the building, expanding the top two floors and adding a second ballroom on the 19th floor. 1942 - It was announced that the hotel would enter a new phase of modernization to restore the Bellevue-Stratford to “the preeminence of its halcyon days.” War and strike delayed the work until its Golden Anniversary where $6 million was invested to include such improvements as air-conditioning and redecoration to all 20 public spaces and guestrooms. 1976 - In October, the hotel closed its doors for the first time with a “I Love The Bellevue Gala" sendoff, put on by The Friends of the Bellevue, celebrating the esthetic, cultural, and architectural impact of the hotel. 1977 - The hotel was placed on the National Register of Historical Buildings in 1977. 1979 - On September 26, the hotel re-opened after a $25 million renovation. 1989 - The new and current owners embarked on a massive $100 million restoration “from sidewalk to the 19th floor.” The newly conceptualized mixed-use building with “Hotel Atop The Bellevue” opened in March. 1996 - Hyatt Hotels & Resorts becomes the management company and renames the hotel Park Hyatt Philadelphia. 2010 - The hotel is renamed Hyatt at The Bellevue. 2018 - Hyatt at The Bellevue realigns into The Unbound Collection by Hyatt and becomes The Bellevue Hotel. At its peak, The Bellevue-Stratford had 1,090 guestrooms furnished with a choice of a Turkish or Swedish bath. No other American hotel matched it in size or grandeur. Suites offered telephones, which were a high-tech innovation of the time. Notice the width of the guest hallways? They were specifically designed to allow the dress of the day, Victorian gowns with hoop skirts 6 feet wide, to easily maneuver with grace. All furnishings were placed in the hands of John Wannamaker, Philadelphia-born merchant and “pioneer in marketing.” Wannamaker’s is considered the first department store in Philadelphia. Every President since Theodore Roosevelt, who was President at the time of the Bellevue-Stratford’s opening, has visited the hotel. Many stayed in the four-bedroom Presidential Suite, which was built in 1954 with guidance from the U.S. Secret Service. Heads of State from Romania, Sweden, Spain, France, Germany, and Ireland, among others, were also known to frequent the hotel. The current guestroom design, led by Marguerite Rodgers Interior Design, is a modern interpretation of classic Philadelphia that explores the rich political, artistic, theatrical, and musical history of the city. The designers collaborated with artistic and cultural organizations in the area, in particular Opera Philadelphia, Walnut Street Theatre, and Pennsylvania Ballet, bringing specific elements from each institute into the interior design. Each floor is themed differently with beautifully drawn costume design sketches from the archives of the opera, theatre, and ballet adorning the hallways, taking guests on a historical journey through the building.